A really charming Church nestled in the pretty village of Ham on the Wiltshire / Berkshire border. Built in the 12th century, it is one of the earliest churches in the Winchester diocese to which it originally belonged. The entire village was owned by St Swithun’s Priory and then Winchester Cathedral until the mid-19th century. The tower of the church is reputed to have been built as a thanksgiving for the village having survived the Black Death in the 14th century. The church was substantially restored in the 18th century and as a result largely escaped the later Victorian passion for radical renovation. The original 18th century manorial and box pews can still be seen. A leaflet giving the history and a guided tour of the church is available in the Church. The first mention of a church at Ham was in 1171 by Henry of Blois, Bishop of Winchester when it was one of nineteen churches in the diocese recorded at that time. 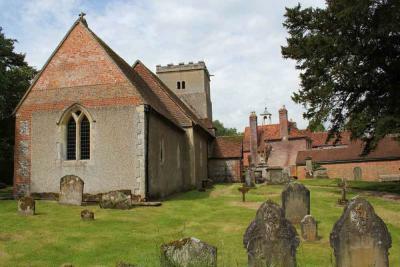 St. Swithun’s priory presented rectors to the parish from 1172 and this right was transferred to the bishop in 1284. This continued until the 19th century apart from the years 1319 when the King presented the rector and 1393 when Robert Kymberle presented. The three stage tower was built in 1349; the date is carved onto a mullion joint of the tower window, and it is thought that this may have been built as a thanksgiving after the Black Death had little effect on the parish. The advowson was transferred to the Bishop of Oxford in 1869 until 1933 when the rectory was united with Buttermere. The Bishop’s right was transferred to the Bishop of Salisbury in 1953. 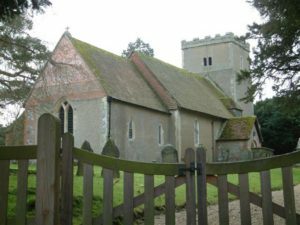 Shalbourne and Ham were joined in 1956 creating the united benefice of Shalbourne and Ham. In 1292 the rectory was assessed for tax at £6 13s. 4d. In 1535 it was valued at £13 and in the late 16th century at £20. By 1831 the yearly average was £457. The rector was endowed with 20 acres in 1363 by what later became East Court manor and this became known as glebe land. In 1828 when the open fields were enclosed the rector received a 20 acre allotment north and south of the rectory. In 1839 he was allotted a rent charge to replace his tithes of £435. In 1341 the rector had a house and garden and by 1828 the rectory was located on the north side of Spray road, east of the village. It was originally a timber framed building with some parts surviving from the 17th century and some walls rebuilt using brick and tiling. In 1864 Charles S. Burder, rector from 1864-1900 replaced the west end of the house with a ‘tall brick cross-wing’ designed by Waring and Blake of London. A later north extension followed the same style. In 1933 this older rectory was replaced with a more modern house but this was sold when the benefice joined with Shalbourne in 1956 when it was no longer required. Many of the incumbents did not actually live at Ham anyway; and some employed a curate to perform the majority of their duties, especially in the 18th and 19th centuries. Notable incumbents include Nicholas Darell (1614-1618) who was a canon of Winchester and Robert Newlin (1643-1688) who was president of Corpus Christi College Oxford. From 1829 to 1831 the curate received an annual fee of £60 and in 1783 the curate held morning and afternoon services at Ham and communion four times a year. In 1851 on Census Sunday 129 people attended in the morning and 137 in the afternoon and in 1864 services were still held twice daily on a Sunday. The church itself is built of rubble and brick with ashlar dressings of coralline limestone. It consists of a chancel with a south vestry, a nave with a west gallery and a north porch and west tower of 13th century origin. The tower was heightened in the 16th century and re-roofed. Extensive restoration was begun in c.1733 and continued through the 18th century obscuring many of the original features. The south chancel wall and the nave were rebuilt, a new east window was installed and a raked gallery was introduced at the west end with pews. A three deck pulpit was later lowered in 1871 and the tower was re-plastered in 1787. All of this was paid for by bequests made by the Hunt family and Reverend Richard Gillingham. In 1849 two new windows were installed on the south side of the nave and the vestry was added and the north porch removed. Internal fittings include a 17th century altar table and 18th century altar rails. The church was restored in 1896-97 and again in 1970. John Hunt (d 1590) and his wife are depicted on a monumental brass; they were the first of the Hunt family to own the Manor. Richard Gillingham was rector from 1688-1719 and is commemorated on a cartouche; he left £900 in his will which was given to a charity called the Corporation of the Sons of Clergy which still exists today. These two were great friends and possibly financially responsible for the early refurbishing of the church which began in 1733. The churchyard contains 18th and 19th century memorials and monuments to the Hunt and Watts families. Three tombs to the Hunts dating from 1719, 1733 and 1754 are just outside the main church door and there are also three tombs of the Watts family members. Other Ham manor estate owners buried in the churchyard include Henry Deacon Woodman and Ralph Brown, and Major Geoffrey Huth, owner of Ham Spray estate from 1924, has a simple plain cross as his memorial in the churchyard. Other graves include Sir Robert Darwin, great grandson of Charles Darwin, who was Rector of the Royal College of Art, and also his friend and colleague Richard Guyatt who coined the phrase ‘graphic design’. 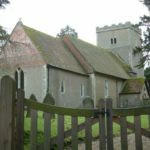 In 1828 the churchwardens were allotted half an acre of land and the £1 rent this yielded paid for repairs to the church, by 1905 it was paid into the church expenses fund but was no longer active in 1975. In 1553 and at the time of the dissolution, 2 oz. of church plate was taken by the King’s Commissioners but a 9 oz. chalice was left although the windows of the church were broken. A cup and paten dating from 1576, a paten of c.1719 and a flagon inscribed 1868 exist as church plate. Three bells date from 1663 and were founded by William Purdue and the fourth is from 1712 and was founded by William and Robert Cor of Aldbourne; this was a gift from William Hunt and Michael Benet. Parish registers date from 1720, with some gaps, and can be viewed at the Wiltshire and Swindon History Centre in Chippenham. In the early 1980s the church was threatened with closure by the diocese and with community efforts and fundraising as well as an English Heritage grant, £60,000 was found and the roof wiring and lighting were renewed and the interior repainted. All was completed in 1990 and a special service was held. By 2000 the bell cradle was restored and the bells could ring again. 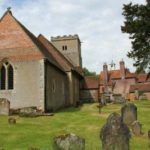 Services are shared once a month with Shalbourne and the Ham and Shalbourne choir sing regularly in both churches.